Here is a guide and the diagrams below so you can see how the job is done. Could someone please walk me thru on how to change a broke timing belt. I just got the car for my daughter. Thank you. You must do the usual disassemble of the engine front starting with the serpentine belt and the timing belt cover, and any accessories that must be removed to gain access. Then I have found these images for you to help you along, there are two belts so you must get them both, also check the oil seals on each of the camshafts and the crankshaft and replace them if they are leaking. Let me know if you have any problems. Only after filling with gas, car does not start. Will spin, but no start. After trying it several times, car eventually cranks, and no problems after that. But as soon as I fill it with gas, get in the car, it does not want to start. The only thing I can think of is you are sturring up dirt in the tank that must be plugging the filter. Have you ever replaced the fuel filter? Thank you for your reply.I dont know for sure if the fuel filter has been replaced. But the symptoms are very strange. The customer claims that ONLY when he fills the tank, gets back into the car, it takes longer than normal to crank. And he also claims, that when it does finally crank, it acts as if he has to clear it out. Likes its flooded or something.I could not duplicate his complaint, but he keeps insisting it's a problem.I spoke with the Kia dealer in our erea, and they have had no complaints of this nature. Checked tsb's, and nothing related to this problem. Any and all your input would be GREATLY appreciated. And once again, thanks for your response. Tony. GMAX AUTO. MT. PLEASANT, NC. The only thing I can think of is dirt in the tank that is causing the problem. However, one would thing that would get moved around regardless of how much gas he gets. I never heard of this type of problem and like you said, there are no TSB's regarding it. I think I would start by checking the fuel pressure and replacing the fuel filter to see if that helps. All the timing marks for a Kia Optima 2.4liter 4 cyc. I just installed a new timing belt on anOptima 2.4l and had all my timing marks lined up. I was wondering if there is a 2-1 or 3-1 ratio from with the crank sprockets? If I turn the crank 360 degrees and check my marks they are off by 180 deg. Doing that also offsets the oil pump sprocket. Why can't I get this thing right? I had originally put marks on the sprockets but have since adjusted them. I had the belt on and started the car but it ran real ruff so I took it back off reset the sprockets again, turned the crank, clockwise once, then checked the marks and they weren't aligned. HELP! Believe it is a 2 to 1 ratio. If you had the car running and it was rough, chances are you were only a tooth off. Install crankshaft sprocket "B" onto crankshaft. Ensure flange is properly positioned. Lightly oil outer surface of spacer, and then install spacer to right counterbalance shaft, with rounded edge of spacer inward. Install right counterbalance shaft sprocket. Tighten flange bolt tightly by hand. Align timing marks on each sprocket and on front case. See Fig. 4 . When installing timing belt "B", ensure there is no slack in tension side. Install tensioner "B" in center of pulley on left side of mounting bolt, and in pulley flange toward front of engine. See Fig. 5 . Align timing mark of right counterbalance shaft sprocket with timing mark on front case. To tighten timing belt "B", lift tensioner "B" so tension side is pulled tight. Tighten bolt to secure tensioner "B". DO NOT turn shaft, or belt will be over-tightened. Ensure timing marks are aligned. Ensure center of span on tension side of timing belt "B" can be depressed by hand. Ensure belt deflection is .20-.30" (5-7 mm). Install crankshaft sprocket flange and sprocket. Ensure flange is mounted in proper direction, with chamfered side toward block. 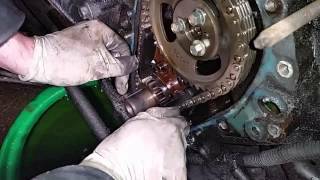 Install special washer and sprocket bolt to crankshaft. Tighten sprocket bolt to specification. See TORQUE SPECIFICATIONS . Insert long screwdriver through plug hole in left side of cylinder block to hold counterbalance shaft in position. Install oil pump sprocket, and tighten nut to specification. See TORQUE SPECIFICATIONS . 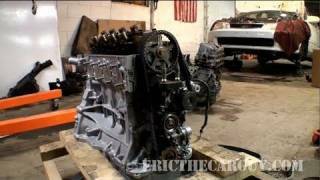 Install camshaft sprockets, and tighten bolts. If auto tensioner rod is fully extended, place it in soft-jawed vise, and compress rod until hole in rod lines up with hole in auto tensioner housing. Insert stiff wire to hold rod in this position. Install auto tensioner, leaving wire in place. 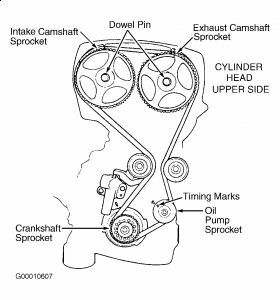 CAUTION:If timing marks on camshaft sprockets do not line up properly, DO NOT rotate sprocket more than 2 teeth in either direction, or valve and piston will touch. If necessary, remove and reposition camshaft sprocket. Install crankshaft sensor. Set timing marks of camshaft sprockets with notches on upper side of rocker cover and dowel pins straight up. 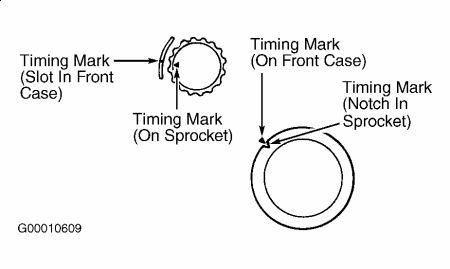 Align crankshaft sprocket timing marks. Align oil pump sprocket timing marks. Install timing belt in order around crankshaft sprocket, oil pump sprocket, idler pulley, exhaust camshaft sprocket, intake camshaft sprocket and tensioner pulley. Gently raise tensioner pulley so belt will not sag, and then temporarily tighten center bolt. Ensure timing mark of each sprocket is still aligned. Remove wire from auto tensioner. Rotate crankshaft 2 complete turns clockwise. Leave in this position for about 5 minutes. 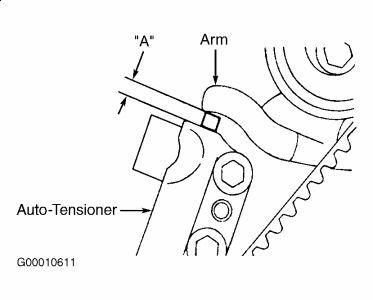 Measure auto tensioner protrusion "A" (distance between tensioner arm and auto tensioner body). Ensure auto tensioner protrusion is .22-.35" (6-9 mm). See Fig. 3 . Install timing belt lower cover and upper cover. Courtesy of HYUNDAI MOTOR CO. I have decided I don't have the time and obviously the expertise to resolve my issue with the timing belt so, I have swallowed my pride and had it towed to a KIA dealership. They are already trying to sell me another car, of course. They started to diagnose the car and told me that I had the timing out by 45 deg. I had every notch and arrow aligned, I set my oil pump, made sure the crank balance shaft was in position so I don't really know how I could be 45 deg. Off my timing. Am I missing something here, or are they jerking me around? He also told me that I had 0 compression on cyl. 1 the others are fine. I did look down in the cyl. And saw no damage at all to the top of the piston. How is this all possible? I figured maybe I bent the crank sensor reluctor ring a bit and that was why it wasn't starting. The car would turn over, had spark, but would not fire. I'm just baffled. Anyway, thanks for your help, I had already joined the kiatechinfo. Com site and had read a bunch on it. I also talked to two different techs on the phone and they both told me that I, first of all, was brave to even try, and second if I had everything aligned I was okay. Thanks again! For you to have the timing out by 45 deg you could have been using the wrong mark? From your description of the time you took setting up, I do not think you did this? For you to have no compression on #1 it must have bent valves somehow? Bent valves would explain the non start ! After the intitial setting up of the belt you should have rotated the motor twice not once to get the marks realigned. Even so they would have been aligned ! Were you just replacing for a new belt? Or replacing a belt that had snapped? Hey Dave, it was not broken, I just decided to replace it because the car had 90k on it and I felt like I was pushing my luck with it. I did turn the crank 2 times to realign and everything seemed good. If I had any thing off alignment I guess the only thing I could question would be the crank. I read that the dowel pin should be at 12 o'clock but I also read that the notch on the crank sensor reluctor ring should be lined up with the notch which throws off the dowel alignment. I ended up lining up the notch instead of lining the dowel to 12 after talking with a tech at a dealership. I am waiting to hear the full diagnostic today the 1st, to see what the verdict is. I am really curious. I asked for all the parts and I feel he should explain how I was so far off my marks. He just said it's hard to explain. Any suggestions? 2002 Kia Optima 4 Cyl Front Wheel Drive Automatic Can I Replace My 2.4l Engine With A 2.7l Engine? My Kia Engine Shakes When I Drive It. It Doesn't Shake As Bad When I Step On The Gas In Drive.